At a local upscale bistro I ordered lunch and scanned the all-natural wares laid out before me. Eager to eat, I had no idea I would meet a product that would become my next review. 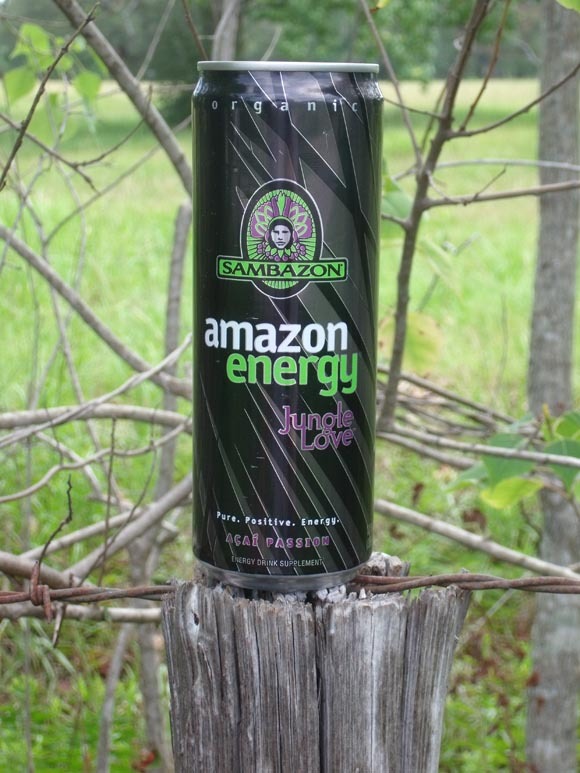 Sambazon Amazon Energy Drink Jungle Love Flavor was just that product. Located next to the eggs and orange juice I wondered if there was a hidden message located in the arrangement. Either way I spend a little more money than I intended to purchase the sleek 8 oz. can. I typically drink water when I eat, and to be careful I fill up a large glass with the clear stuff just in case I need a plan B. So with a scrumptious spread laid out on the table before me I decide to multitask. Review this new energy drink and eat at the same time. Hopefully I’m not mixing the wrong things inside my stomach, the consequences could be dire. But risk can provide results, so I scan the label to see just what I’m in for. First I am curious as to just what type of flavor “jungle love” is, and Acai Passion is the answer. What is Acai Passion exactly? My guess is that it is probably better than regular Acai. Next the label informs me that all of the ingredients are organic and good for me, a positive element in my opinion. Also I find an explanation of the history Sambazon Energy Drink and will relate the necessary info now. Apparently Sabazon Jungle Love is made with more than just Acai Berry, it’s made with “powerful love herbs” that create “…an organic passion potion that goes way beyond giving you an energy boost.” I read more and the explanation mentions things about the Amazon River and passion and uses the word “uplifting” to describe the love herbs. Considering the fact that there could be strange side-affects I decide to sit in an isolated place away from others, just in case. Now there is a review to complete. The can has been opened and a sip taken. The taste is magnificent. For those unfamiliar with Acai Berry it tastes most similar to the cranberry, but with less bite. So I take another sip. The carbonation stays strong and the taste remains satisfying and easy on the taste buds. I don’t feel uplifted in any way yet, but my Sabazon Jungle Love experience is still young. I drink more and the flavor never grows old. No aftertaste is present which is great. So both lunch and Sambazon Energy Drink are gone and I was satisfied with both. I don’t feel any more passionate or energetic than before, but I do think I would definably buy Samabzon Jungle Love again. Final Review: Buy a six pack! Great taste and fantastic ingredients come together to form an awesome product that is totally worth buying.